The term celestial refers to the sky and or Heaven. Mara's 16pc dinnerware set - celestial is designed with each individual stoneware dinner piece being artistically different. 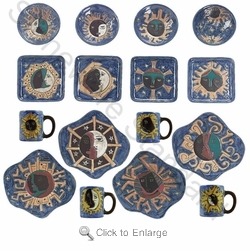 Check out our Celestial - Individual & Complement Pieces to fill out your Mara Dinnerware set.